Hi everyone! 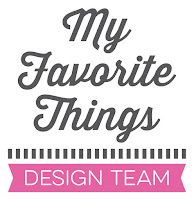 Today is the third day of the My Favorite Things February release countdown. This release is packed with amazing new products and it was so fun to play with all the new stuff! The new products will officially be available on the MFT online store on February 7th at 9:00 pm EST (= Europe: February 8th at 3:00 am CET). Most of the supplies I used for this project are linked in the link-up tool at the bottom of this post. Ok… as a Swiss girl (and cheese lover), I couldn’t resist combining these SUPER CUTE mice with cheese LOL. I created the cheese with a piece of Pineapple cardstock. I punched some holes through the panel with circle punches. I sponged the background of a white top-folded card base using a blending tool and Distress ink. The small heart is from the Tag Builder Blueprints 5 Die-namics and was die cut from Wild Cherry cardstock. I fixed the cheese and the mice with foam pads for more dimension. So adorable, Francine! I love how you created 'Swiss Cheese' with your cardstock so these cute little mice could peek through the holes...really clever and fun! Beautiful blending with your DI's, too..such a fun card! Trop choupi ces souris dans le gruyère!! I always LOVE seeing how you use the new goodies Francine. This card is GENIUS! Oh my goodness!!! This card is absolutely adorable!! Off to pin it for future inspiration !! I just love your style and another card I can't wait to case. I will enjoy the sets when they come up for sale. Francine--You are so talented and clever! How adorable this card is! Love that whimsical little mouse in the cheese! Francine, another creative card. It looks so sweet with the mice peeking out of the holes of the cheese! Thanks for sharing. 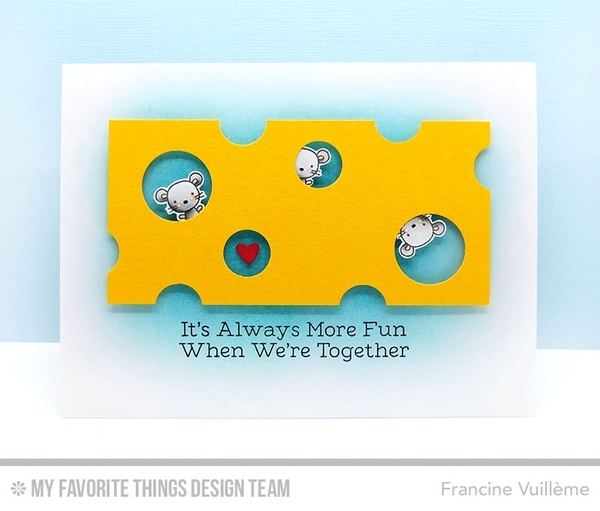 Swiss Cheese and mice really go together to make a charming card! This card reminded me of the book..."Who moved my cheese". This is so adorable.